So finally you’ve become a new gun owner (talking about handguns here). You decided to get that one gun statistically primarily for home protection, many for general self defense including concealed carry. Now on down the road, you may turn into a genuine shooter, but for now, you’ve got the gun and you’ve got to figure out what to do with it. What you do not want to do is buy a gun, load it and put it away to use only in case of an emergency. If you do not intend to familiarize yourself to automatically work the mechanisms of the gun and fire it regularly, you are better off without it. If you purchase, or have purchased a semi automatic pistol, as a new gun owner, your familiarization and practice with the pistol is significantly more important than with a revolver, though regular practice with both is critical. NOTE: At the bottom of the page check out my service that will enable you to pick the gun and carry method that will work for you with no guesswork. Where do you start and where do you get the instruction you need to shoot the gun proficiently? Well, let’s start at the beginning. The owner’s manual. If you purchased a new gun it will include one. If you purchased a used gun, it may not have any instructions with it. In that case, first check online to see if you can find a manual from the gun’s manufacturer. Some major gun makers have their buyer’s guides and manuals online. FIRST BEFORE TAKING IT TO SHOOT IT: Learn to disassemble and clean the gun from the manual. Then do it. Before you shoot it. That’s right, most guns come with some oil and/or grit in the works that can significantly affect the operation of it. New guns come with some degree of grease and oil from the factory, and many have been test fired without cleaning afterward. So learn how to clean it first, and do it. By the way, before you begin to disassemble it, check it to see if the gun is loaded. Pull the slide back and check the chamber in a semi-auto, open the cylinder in a revolver and confirm that it is empty. After confirming an empty gun, point it in a safe direction and dry fire it to release the striker or hammer (semi auto only-not necessary with a revolver). Do this even if you’ve already done it several times and do it every time you handle the gun. Fail to do this and you will eventually shoot something you don’t mean to shoot, period. Don’t ever make it negotiable, just do it every time. Be sure doing all this, it is always pointed safely into an area that would contain a negligent discharge . Remember, just pointing it at a wall, you could be endangering somebody in the next room. A 5 gallon bucket filled with some kind of media or sand makes a good safe pointing device. Point: Do a chamber check every time you pick up any gun. I recently asked a room full of guys who are long time experienced gun owners and shooters how many of them had ever shot something they didn’t mean to shoot. Every one of the twelve hands went up. It can happen to anyone at any time. Download and print the NRA’s safety rules. Memorize and practice them. One unintended shot can ruin your life. -Keep your finger off the trigger until your sights are on an intended target. Obey those two without exception and you will not shoot something you do not intend to shoot. Be lax with either of those and a tragedy is likely to occur. Before going to the range, be sure you are prepared to shoot without doing harm to yourself aside from shooting yourself. You will need some ear protection (nobody will have to convince you of this after you shoot a few rounds without it-it hurts). Earplugs work ok. Ear muffs work better. 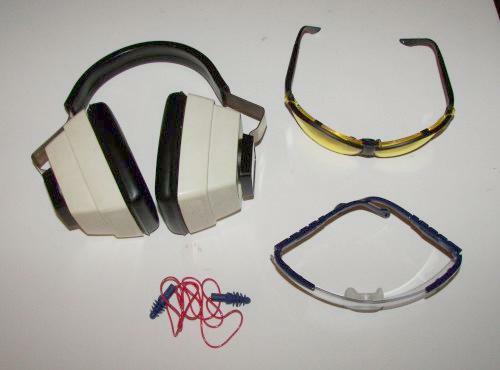 Most ranges will require the use of approved eye and ear protection. Some will allow earplugs, others will require nothing less than muffs. Also, eye protection is a must. In the shooting group that I led for our church, we regularly had people’s foreheads bloodied with odd shell casings ejected backward hitting them. Imagine what that would do to an eyeball. A set of safety glasses and earmuffs can be purchased for around $25-$30, a small price to pay for what they prevent. Don’t fight it, get and wear the safety gear. I’m blessed to live in the “Natural State” of Arkansas which is both a gun-friendly state and a state rich in natural beauty. It has vast rural areas that provide great opportunities for recreational shooting and practice. 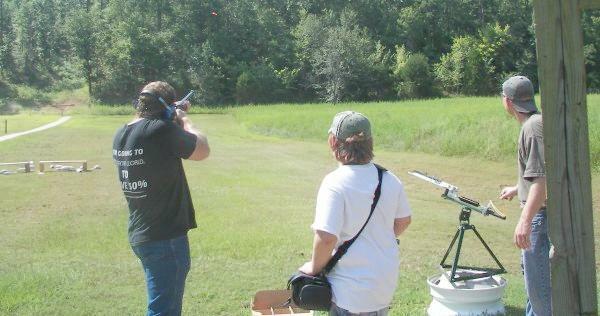 If you have access to a privately owned indoor or outdoor range with instructors, you’ve got the ideal place. Unfortunately there are more places without one of those than with. So maybe a private gun club is nearby that you can join and have somebody there. Perhaps there's an experienced range officer that's willing to give a new gun owner some beginning instruction. If not, maybe within a reasonable drive there is a free public range managed by your state game and fish commission or park service. Finally, if none of those are available, try to find a safe place in the country to set up targets and get a gun-experienced friend to help you. If none of those are available, I really don’t know what to tell you and probably can’t help you here. Note the wooded hill at the end of this Ozark National Forrest Range. The hill insures that no bullets go astray. Any place you shoot should have a reliable backstop where there is no chance that a bullet could go through the backing or ricochet and hit an unintended target. When getting started, as a new gun owner, hopefully you have somebody to help you by watching until you get the basics of handling and firing down. As a new gun owner, (or any gun owner for that matter) if you’re a guy, leave the testosterone in the truck locked in the glove compartment. Ask questions. As a new gun owner you must know that there are no stupid ones. With guns the only thing stupid is guessing when you could have an informed answer. If you are a woman, you may ignore the advice above. Guns and other people will not cause a rise in testosterone and consequent loss of your mind. BELOW: No more guesswork about handguns and concealed carry.